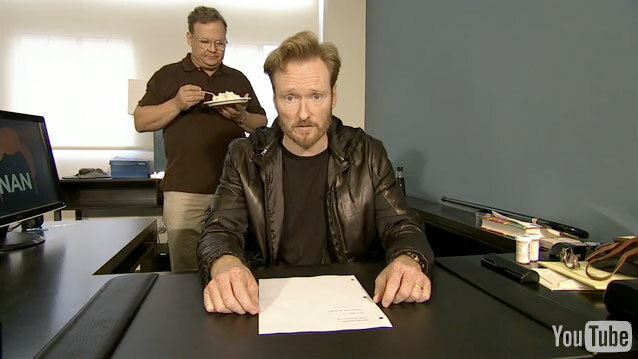 Conan O’Brien’s original sidekick Andy Richter will be part of the new TBS show Conan premiering next month, although Conan states jokingly, “This decision was made without my authority.” A video posted on the TeamCoCo blog confirmed the news today, as well as an official TBS press release. The Conan/Richter started with the premiere of Late Night with Conan O’Brien in 1993. Richter left in 2000 to pursue solo interests in television and acting. In 2009, he returned as the announcer for The Tonight Show with Conan O’Brien when Jay Leno moved to an earlier timeslot. Conan will premiere on TBS Monday, Nov. 8, at 11 p.m. (ET/PT).